Tune into Jazz Profiles this Sunday February 18 from 2-7 pm ET to hear Sid Gribetz feature Art Blakey’s Jazz Messengers. Art Blakey is the dynamic drummer and band leader who nurtured many young jazz stars and inculcated the “hard bop” sound in the groups he organized over the many decades of his career until his death in 1990. Blakey already was using the term Jazz Messengers with his 17 piece rehearsal group and other ensembles in 1947. The idea of shepherding young talent came to fruition with the 1954 “Night at Birdland” featuring Clifford Brown. Blakey coalesced this conception, and the moniker “Jazz Messengers”, with the cooperative small group combos he shared with Horace Silver and then continued on his own as he gave birth to this genre of soulful modern jazz in the mid-1950's. Even in a five hour program, we will have time to focus only on a limited aspect of Blakey’s prolific career. Thus, we’ve chosen to explore a period of golden flowering of the ensemble, starting with the arrival in 1958 of Benny Golson. Golson organized matters and brought fellow Philadelphians Lee Morgan, Bobby Timmons and Jymie Merritt into the fold; instilled their repertoire with his sophisticated compositions (and Timmons’s, too); and thereby took the Messengers to the “next level”. 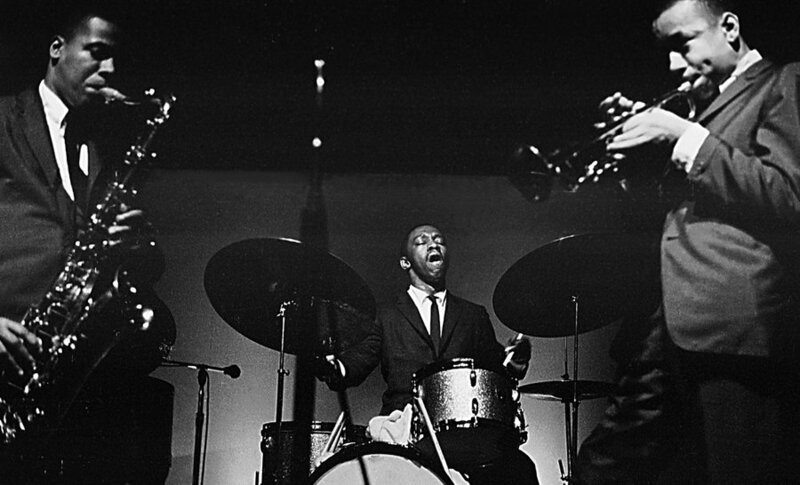 In the fall of 1958, the group recorded its seminal Blue Note album “Moanin’” and embarked on an extended European tour which put it on a broader map. Golson would soon leave, eventually to be replaced in the tenor saxophone chair by Wayne Shorter. Shorter and Morgan, with their crackling and crisp virtuosity as soloists, and lyrical song writing and ensemble playing, set another high bar for the Jazz Messengers style. Morgan would depart in 1961 to be replaced by Freddie Hubbard; trombonist Curtis Fuller would be added to make the group a sextet; and Cedar Walton would come on board to take the piano bench. All would contribute their original compositions to the band’s “book”, songs that are now part of the established modern jazz repertory. Additionally, the Jazz Messenger sound turned on their innovative arrangements and creative solos that infused popular standards with fresh, new meaning. Blakey toured Japan to an ecstatic response in January 1961, and returned frequently thereafter. From these trips, he assimilated a Japanese flavor into songs such as Ugetsu, On The Ginza, and Kyoto adding to the scope of the presentation.